Speaking of cleaning out the digital recorder… as we did yesterday afternoon. I just went back over my interview with Neil Cornrich, the agent for guard Stephen Neal. Remember, Cornrich had discussed how his client decided against retiring earlier in the week. 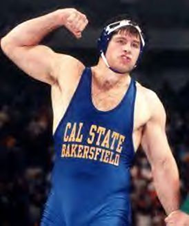 But Cornrich, a huge amateur wrestling fan, also reminisced about the first time he saw Neal… dominating the collegiate wrestling ranks at Cal State Bakersfield (left, from an InterMat article). And really, it’s insane to think about how unbelievable Neal was on the mat. Check out his bio. It tells of him finishing his last two collegiate seasons as an undefeated Div. I champion, then how he became the 1999 U.S. Freestyle champion, Pan-Am Games champion, and World Champion. He became one of two Americans to be named FILA International Freestyle Wrestler of the Year. The other was the icon, John Smith. So, Neal was pretty sick. No wonder he has eyes toward further abusing of Brock Lesnar (who he beat in college)in the UFC after retirement. Anyway, Cornrich was one of the people who helped discover Neal and point him toward football. What does he recall? And Neal’s transformation from wrestler to football player was impressive. Even still, he would be one of the guys in the NFL who could take down any other in a dark alley. And that says something. Cornrich summed up Neal’s feelings about his career path. Stephen Neal a "force to be reckoned with"